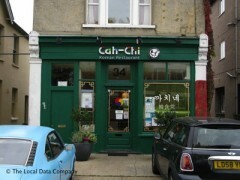 About: Ga-Chi serve a variety of Korean dishes at their restaurant. We live in Wimbledon and as the extended family, about 14 of us, we eat not infrequently at Ga-chi in nearby Raynes Park and find them very good. We are a Chinese/English/French family and traipse along there with various members of the family, sometimes including all from 73 years to three months all. We love Korean food and this seems to us typical of unpretentious Korean food. We are eating there tonight..New Year's Eve with our french side of the family..as a treat.